Note: This review is based on a screening of the English dub of Arrietty, hence the use of the English voice actors. Who are all excellent, incidentally. Arrietty (Saoirse Ronan) is a member of a race of thumb-sized people called Borrowers, so named because they sneak out of the nooks and crannies of human houses in order to 'borrow' whatever they need to survive. It's a perilous existence, since the smallest, most benign object to humans can be a life-threatening hazard to a Borrower, but it's also one filled with a sense of wonder and adventure, one which Arrietty is eager to join once she comes of age. On her first 'Borrow' with her father (Mark Strong), Arrietty is inadvertently spotted by Sho (Tom Holland), a sickly young boy who is staying in the house, which is owned by his aunt and secretly the home of Arrietty and her family. 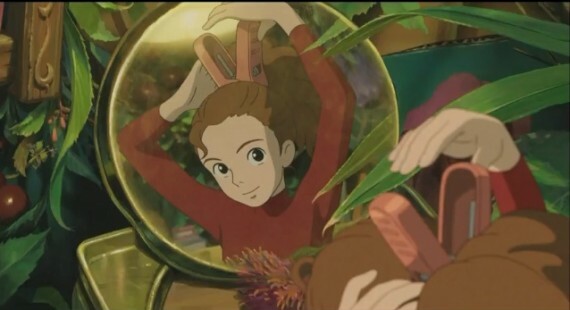 Initially ashamed and afraid, since being seen by humans is considered the greatest threat to the Borrowers, a tentative friendship develops between Arrietty and Sho, one that could save her family from the nefarious attentions of the housekeeper (Geraldine McEwan) who has become obsessed with finding them. Based on Mary Norton's The Borrowers, Arrietty is a film which has a quiet, unassuming grace to it that belies its extraordinary beauty. As with all the Studio Ghibli works, the film looks absolutely gorgeous, and though much of the credit should go to first-time director Hiromasa Yonebayashi for this, the hand of Ghibli co-creator/creative guru (and director of my second favourite film of the last decade) Hayao Miyazaki is felt very strongly in the look and pace of the film, no doubt owing to his involvement as screenwriter and developer of the project. The world is brought to life in incredibly vivid and vibrant watercolours, giving the film the feel of a living painting, and the movements of the characters - be they human, borrower or beetle - are rendered in a smooth, effortless style that is reminiscent of dancing, rather than simple movement. Arrietty's unhurried pacing even extends to the character of Haru, the maid whose interest in hunting the Borrowers should be the engine of the drama, but which is treated in a slightly offhand manner that shoves it to the background in favour of developing the central relationship. It makes the film a richer experience, since it means that when Haru does threaten Arrietty and her family's way of life, the stakes are appropriately high, but the lack of traditional incident or action until the final third may make it a touch sluggish for really young kids, or those expecting something else. That's one of the few criticisms I can offer of the film; it probably won't work for kids hoping to see The Smurfs. Much like the Borrowers themselves, the power of Arrietty remains hidden until ready to reveal itself. I found myself liking the film a great deal throughout, but when it came to the final five minutes or so, once the main plot was wrapped up, I was worried because I didn't like it more. The story, animation and music were all wonderful, and the typically strong voice acting carried the film along, but it felt like it was reaching towards something that was just out of its reach, and it didn't reach it until the very final moments, when everything seemed to fall into place. The ending is incredibly poignant and moving, leaving the characters in a state of transition as they move out into a wider world. It's filled with danger and wonder, and is a pitch-perfect ending to a film full of the joy of discovery and adventure. It is one of those transcendent endings that raises a film from being good to great.